Xypex is a unique chemical treatment for the waterproofing, protection and improvement of concrete. XYPEX ADMIX C-1000 is added to the concrete mix at the time of batching. Xypex Admix C-1000 consists of Portland cement, very fine treated silica sand and various active, proprietary chemicals. These active chemicals react with the moisture in fresh concrete and with the by-products of cement hydration to cause a catalytic reaction which generates a non-soluble crystalline formation throughout the pores and capillary tracts of the concrete. Thus the concrete becomes permanently sealed against the penetration of water or liquids from any direction. The concrete is also protected from deterioration due to harsh environmental conditions. Note: The Admix C-Series has been specially formulated to meet varying project and temperature conditions.Xypex Admix C-1000 is designed for typical Portland cement-rich concrete, where normal to a mild retarded set is desired. See Setting Time and Strength for more details. Consult with a Xypex technical services representative for the most appropriate Xypex Admix for your project. Xypex Admix C-1000 is packaged in 60 lb. (27.2 kg) pails and 50 lb. (22.7 kg) bags. Admix C-1000 is also available in cartons containing 10 lb. (4.5 kg), 12 lb. (5.5 kg), and 15 lb. (6.8 kg) soluble bags. For specific projects, contact the manufacturer for availability of custom sized packaging. Xypex products must be stored dry at a minimum temperature of 45ºF (7ºC). Shelf life is one year when stored under proper conditions. Note: Under certain conditions, the dosage rate for no fines grade may be as low as 0.8% depending on the quantity and type of total cementitious materials. The maximum use level is 2% by weight of cement for potable water applications. Consult with Xypex’s Technical Services Department for assistance in determining the appropriate dosage rate and for further information regarding enhanced chemical resistance, optimum concrete performance, or meeting the specific requirements and conditions of your project. Two concrete samples containing Xypex Admix at 3% and 5% respectively, and an untreated control sample were tested for water permeability. Both the treated and untreated samples were subjected to a pressure of 150 psi (350 ft. water head). Results showed moisture and permeated water throughout the untreated sample after 24 hours. However, the Xypex Admix samples showed no leakage, and water penetration of only 1.5 mm after 120 hours (5 days). Six Xypex Admix-treated and six untreated concrete samples were tested for water permeability. Pressure was gradually increased over five days and then maintained at 7 bars (224 ft. water head) for 10 days. While the six reference samples showed water leakage beginning on the fifth day and increasing throughout the test period, the Xypex Admix samples showed no water leakage at any time during the test. Concrete samples 120 mm thick containing Xypex Admix were tested with the same size reference samples for water impermeability. Samples were subjected to hydrostatic pressure for 28 days. Water totally permeated the untreated samples but no water penetration was detected in any of the Xypex Admix-treated samples. Concrete samples containing Xypex Admix at various dosage rates (1%, 2% and 5%) were tested against an untreated concrete control sample. Compressive strength test results after 28 days indicated a significant strength increase in the samples incorporating Xypex Admix. The compressive strength increase varied between 5% and 20% (depending on the Xypex Admix dosage rate) over that of the reference sample. At 28 days, the compressive strength test of the concrete containing Xypex Admix measured 7160 psi as compared to the reference sample at 6460 psi (a 10% increase). Concrete samples containing Xypex Admix were tested against five samples containing other admixtures and against a control sample, to determine resistance to corrosion and deterioration caused by contact with aggressive chemicals. All samples were soaked in a 5% sulfuric acid solution at 20ºC for six months. Various evaluations and measurements were assessed every month during the test period, including: photographic comparisons, relative dynamic modulus of elasticity, percentage change in length, weight and flexural rigidity. Although the Xypex Admix sample was subjected to acid conditions well outside its published range, the results confirmed Xypex with the best performance among the seven samples tested. Concrete samples containing Xypex Admix at different dosage rates (3%, 5% and 7%) were tested against untreated control samples for sulfuric acid resistance. After immersion in the sulfuric acid, each sample was tested for weight loss on a daily basis until a weight loss of 50% or a definite response trend was obtained. The percentage weight loss of the samples containing Xypex Admix tested significantly lower than the control samples. Xypex Admix-treated concrete samples were immersed in an ammonium-sulphate solution and tested for “resistance in a harsh environment”. The performance of the Xypex crystalline technology was compared with five. After 300 freeze/thaw cycles, the Xypex Admix-treated samples indicated 94% relative durability. Exposure testing of potable water in contact with Xypex-treated samples indicated no harmful effects. Add Xypex Admix in powder form to the drum of the ready-mix truck. Drive the ready-mix truck under the batch plant and add the balance of the materials in accordance with standard concrete batching practices. Mix materials for a minimum of 5 minutes to ensure that the Xypex Admix has been thoroughly dispersed throughout the concrete. Mix Xypex Admix with water to form a very thin slurry (e.g. 15 - 20 lb./6.75 - 9 kg of powder mixed with 3 U.S. gallons/13.6 litres of water). Pour the required amount of material into the drum of the ready-mix truck. The aggregate, cement and water should be batched and mixed in the plant in accordance with standard practices (taking into account the quantity of water that has already been placed in the ready-mix truck). Pour the Admix slurry into the truck and mix for at least 5 minutes to ensure even distribution of the Xypex Admix throughout the concrete. Add Xypex Admix to the rock and sand, then mix thoroughly for 2 - 3 minutes before adding the cement and water. The total concrete mass should be blended using standard practices. The setting time of concrete is affected by the chemical and physical composition of ingredients, temperature of the concrete and climatic conditions. 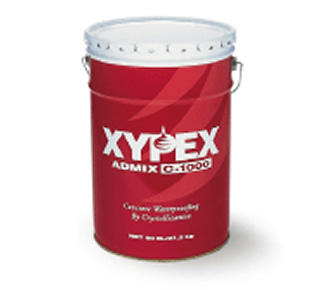 Xypex Admix C-1000 is designed for typical Portland cement-rich concrete, where normal to a mild retarded set is desired. Concrete containing the Xypex Admix C-1000 may develop higher ultimate strengths than plain concrete. Trial mixes should be carried out under project conditions to determine the setting time and strength of the concrete dosed with Xypex Admix C-1000. Consult with a Xypex technical services representative for the most appropriate Xypex Admix for your project. When incorporating Xypex Admix, the temperature of the concrete mix should be above 40ºF (4ºC). For more instructions, alternative installation methods, or information concerning the compatibility of the Xypex treatment with other products or technologies, contact the Technical Services Department of Xypex Chemical Corporation or your local Xypex representative. Xypex is alkaline. As a cementitious powder or mixture, Xypex may cause significant skin and eye irritation. Directions for treating these problems are clearly detailed on all Xypex pails and packaging. The Manufacturer also maintains comprehensive and up-to-date Material Safety Data Sheets on all its products. Each sheet contains health and safety information for the protection of workers and customers. The Manufacturer recommends you contact Xypex Chemical Corporation or your local Xypex representative to obtain copies of Material Safety Data Sheets prior to product storage or use. The Manufacturer warrants that the products manufactured by it shall be free from material defects and will be consistent with its normal high quality. Should any of the products be proven defective, the liability to the Manufacturer shall be limited to replacement of the product ex factory. The Manufacturer makes no warranty as to merchantability or fitness for a particular purpose and this warranty is in lieu of all other warranties expressed or implied. The user shall determine the suitability of the product for his intended use and assume all risks and liability in connection therewith.